When you’re looking for a math assembly show that’s exciting, educational, and perfect for ALL elementary students, you’ve got a hard job. "Doug is a wonderful presenter. He engages both the students and staff. His message is still being talked about and referenced in the classrooms. Exceptional - I would highly recommend this show!!!!" 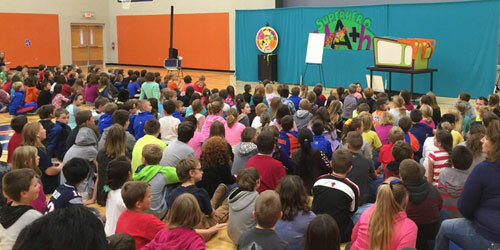 You might think that it’s impossible for a math school show to teach and entertain all grades at the same time, but it’s not. It’s a job for a Superhero! 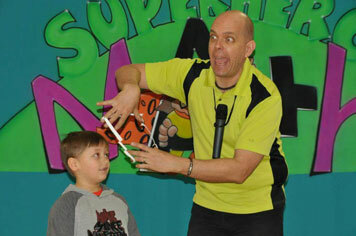 The Superhero Math school show is guaranteed to have your teachers and students cheering for more! You provide the audience and we’ll provide the incredible lessons and all the excitement. 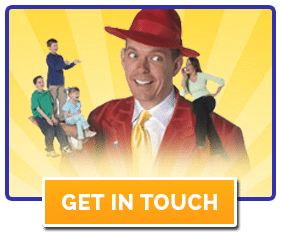 Get ready to find out what happens when all the fun of a Nickelodeon styled TV game show - the crazy games, the wacky stunts, incredible illusions and magic, and the outrageous antics - collides with elementary math lessons and terms. 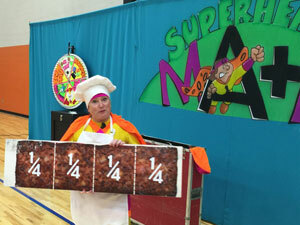 You get the Superhero Math show, the most ambitious elementary math assembly show ever to capture your students' interests and ignite their imaginations. And with our super tour schedule we can even travel to you even if your school is outside of Michigan, our regular performing area. 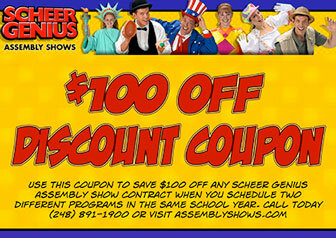 Now you can have that kind of success with assembly shows at your school too. It’s easy. It doesn’t matter if your school is outside of Michigan. We travel throughout Ohio, Illinois and Indiana regularly too. Call me, Doug Scheer, at (248) 891-1900 and we can put your school on our calendar. Your jaw will drop when you see this. We make math thrilling and fun while reinforcing the classroom lessons your teachers work so hard to teach. I promise that your students will get more excited about math than ever before as they learn math puzzles, games, and even mathemagic tricks that they can do at home. They won’t learn about adding, subtracting, or dividing (they get enough of that in class) but I do guarantee that your students will understand that math is all around them and is a big part of what they do and see every day. This show is HUGE! When we arrive to your school, you can expect us to set up on the floor because most school stages are too small for this show. We bring in a trailer full of equipment, a 35’ wide backdrop, complete costumes, a full sound system, and superhero-sized props that you won’t believe. Throughout this math school show fourteen kids participate on stage, then everyone takes home top-secret instruction sheets so they can prove to their families that the real math superhero is living under their roofs. I guarantee that your teachers and students will love the Superhero Math school show. 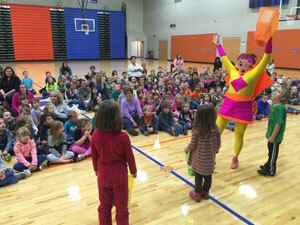 It’s simply the biggest and most engaging elementary math assembly show you’ll ever seen. Call me, Doug Scheer, and I’ll prove it. (248) 891-1900. Check out our promotional video then become a superhero to the students at your school just by filling out the contact form and I’ll send prices your way immediately.